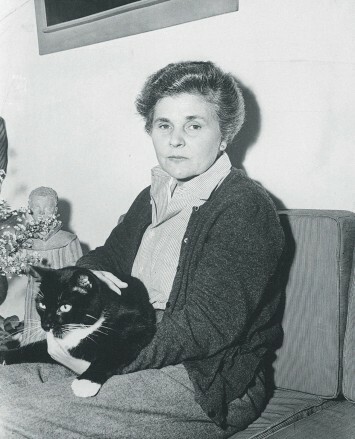 Elizabeth Bishop and a cat. The sestina is an extremely structured, extremely demanding poetic form that relies heavily on the repetition of six carefully chosen words. As you might imagine, they’re really, really hard to write. And the task becomes even harder if you want to avoid sounding monotonous, trite, and sing-songy (please never, never ask to see my own extremely embarrassing attempts). But all that aside, when done well—well, they can turn into something pretty incredible. Such as, say, Elizabeth Bishop’s brilliantly executed “Sestina,” which happens to be both one of my absolute favorite poems and one of my absolute favorite pieces of writing about a house. So now I’ll stop talking and let Elizabeth take over. This entry was posted in August 2014 and tagged almanac, August 2014, elizabeth bishop, houses, Marvel Stove, poems, poetry, sestina. Bookmark the permalink. ← Home is where the liver smell is.